Ann Getty’s eyes have always been wide open—whether as a child searching for ripe peaches to pick or as a renowned designer of “exceptional” antiques. 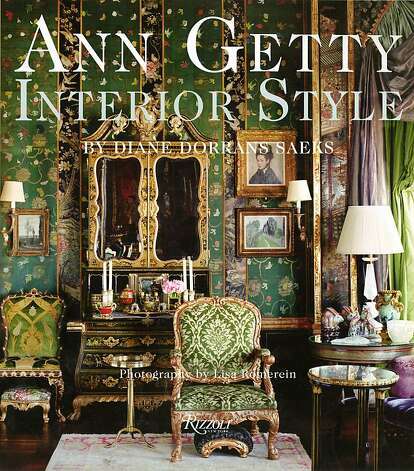 “I am drawn to the great examples in any genre, whether furniture, textiles, rugs, or art, or something I don’t even know about yet,” she tells Diane Dorrans Saeks, author of Ann Getty: Interior Style. © 2012. Visit rizzoliusa.com. Image via sfgate.com. Honed by studious years at UC Berkeley and in Asia, Getty’s style feels “personal and cohesive,” yet wildly eclectic and unusually intense. With Saek’s book, readers can tour nine homes Getty has decorated and learn from how she combines diverse styles to create stunning fantasy rooms. While Getty lavishes elegant bedrooms and bathrooms on her clients’ homes, she experiments in her own country house. When the ever-changing “blue bedroom” was photographed for Saeks’ book, the primarily blue and white color scheme—established by the teal walls and pale embroidered silk draperies—was echoed by chairs upholstered in 18th-century blue silk brocade and challenged by pink and white floral Chippendale chairs. For a startling contrast, a nearby “bamboo” guest bedroom reflects the aesthetic of Mughal India, complete with an antique padouk wood chest painted with palace garden scenes. 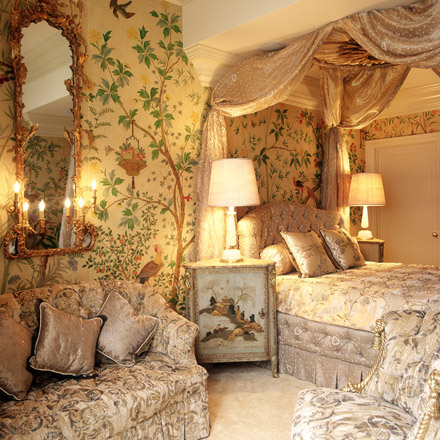 This entry was posted in Bedroom Decor and tagged Ann Getty, antiques, bedroom decor tips, elegant bedrooms, fantasy rooms, glamorous bedroom decor, interior design, Rizzoli Books by Bedrooms & Baths. Bookmark the permalink.